You can also read Everton v Man City live text. Right. That's it from us here. There will be plenty of reaction and analysis in our match report here. But there's two games about to get going. You can follow Everton v Manchester City here. Or Watford v Southampton here. Jose Mourinho is at his cryptic best. This was his answer when asked about John Terry's sending off. I prefer to have no views. I prefer to try to keep quiet. I know many people are disappointed with this result - people love Chelsea to lose again. I'm so happy the players got what they deserve. Five points in three matches is not enough. The feeling is we are fighting against a lot. But today we won. Pedro had 56 touches during that game, and as you can see, he likes to mix up his position. I see betting agencies are already giving out odds on whether John Terry will last the season with Chelsea. Expected, or overreaction? Talk about doing it the hard way. Chelsea fans up and down the land breathe a collective sigh of relief. One last ball into the mixer from Claudio Yacob. Thibaut Courtois is underneath it. Rickie Lambert knocks down Chris Brunt's cross and Salomon Rondon hits a shot from close range against Courtois. Jonas Olsson heads over the corner. Hazard is a joy to watch. He keeps the ball in the corner, not with strong hold-up play, but with turns and tricks and composure. Lovely stuff. Clever from Hazard. Sloppy from Gnabry, who gives away a silly free-kick on the Belgian and Chelsea can eat up time. John Stones continues in the heart of Everton's defence despite speculation surrounding his future. You can get full team news in our live text commentary right here. Chris Brunt! So close. Cutting in from the right he swings a right boot and it angles over the bar. James Morrison, the scorer of both of West Brom's goals in this game and this season, is replaced by Craig Gardner. Serge Gnabry wriggles into space outside the area, but his shot is tame. Eden Hazard takes out two defenders by shifting one way and then another before flashing wide. Bye bye Pedro. It's been a blast. That's a pretty smart debut from the Spaniard. Mikel is on in his stead. It might be a slightly less flourishing performance from the midfielder. Watford make one change from their draw with West Brom last time out as defender Jose Holebas comes in for Miguel Layun. Watford XI: Gomes, Nyom, Prodl, Cathcart, Holebas, Capoue, Behrami, Anya, Ighalo, Jurado, Deeney. Southampton make two changes from their midweek Europa League outing as defender Cedric Soares and midfielder Steven Davis replace James Ward-Prowse and Jay Rodriguez. Southampton XI: Stekelenburg, Yoshida, Fonte, Caulker, Targett, Wanyama, Romeu, Cedric Soares, Mane, Steven Davis, Pelle. Serge Gnabry gets it back from a short corner, marches into the area, and puts it into row Z. Frustrating. Pedro, a player who Manchester United fans wanted, pulls across for Falcao, a player United fans are less fussed about, and the striker scuffs wide. Joey means "spot on", obviously. Diego Costa could have finished it all off here. He turns two Albion defenders inside out but puts a nine iron under the ball and clips it well over. That's it for Costa, who is replaced by Radamel Falcao. Callum McManaman goes off for West Brom, with Serge Gnabry on for his debut. Chelsea prod away at West Brom, but can't make anything. And then Albion nudge away on the edge of the Chelsea area, before a Craig Dawson shot is deflected wide. Chris Brunt's corner is claimed by Thibaut Courtois. Rickie Lambert, on for James McClean, feeds Callum McManaman into the left channel of the area. He cuts back and curls his shot just wide of the post. Other than that, Chelsea are successfully slowing the pace. Curious one this. Ivanovic wants to take the throw-in, as being as he's on the touchline receiving treatment anyway. Mark Clattenburg says "sorry sunshine", as he's not let him back on yet. Ivanovic then comes on immediately after the throw-in. It's a waste of everyone's time. Callum McManaman has a yellow card for kicking the ball away. Silly boy. Salomon Rondon gets a sniff from a West Brom corner, clipping just wide from the edge of the area. We'll have a brief break while Branislav Ivanovic gets a blow to the head looked at. Looking at the John Terry sending off again, it's unlikely Salomon Rondon would have beaten Thibaut Courtois to the ball. The Chelsea keeper was able to casually pick it up. Plenty of tugging from Terry though. Gary Cahill has his mask on to protect a broken nose. Chelsea need a superhero performance from the defender. Pedro sizzles a ball across goal and Costa does well to keep his first-time shot down but it's into the side netting. We really have a game now. Callum McManaman swings a tasty left-wing cross and James Morrison somehow flicks it off the back of his head and sends it into the far corner. Ten-man Chelsea are on the ropes. A reshuffle for Chelsea as Gary Cahill is on for Willian. John Terry really, really did not want to go off. He spent ages arguing with the referee. Then he took off his shinpads. Then he finally left the field. Meanwhile, Nemanja Matic hits a decent free-kick which Boaz Myhill palms away. Rondon's free-kick from just outside the area hits the wall and goes over. From the corner Chris Brunt gets the ball 20 yards out, but his shot squeezes through to the keeper. What a terrible week for John Terry. He's in a foot race with Salomon Rondon. The Venezuelan is winning hands down. There's a bit of a tug from Terry, who is the last man, and Rondon hits the ground. Mark Clattenburg produces a red card. It was just outside the area. Talking about calming down, Costa and Claudio Yacob are getting in each other's faces. A little bit of rutting going on, but both men escape punishment. James McClean, already on a booking, needs to be careful. He's having strong words with the referee after giving away a free-kick. Settle down James. If I'm only paying half-attention, and I squint a bit, it sometimes looks like an in-his-pomp Joe Cole when Pedro is on the ball. Like I say, only sometimes. No danger from that though. Darren Fletcher tries to launch a long ball to Salomon Rondon but it's way too ambitious. Weather update. It's wet. Really wet. Chris Brunt has won West Brom a corner. Chelsea start the second half and immediately look to build from the back. And here's how Pedro scored on his debut, linking up with Hazard. Plenty of possession, as well as goals, for Chelsea in that first period. There's a Spanish flavour to Chelsea's goals in that half. Pedro, Costa, Azpiliceuta - all Spanish and all on the scoresheet. Azipilicueta is terribly excited, he's now having a pop from 20 yards. But it's blocked. And there's the half-time whistle - there were four goals in 22 minutes - can we expect more? It's not only raining water at The Hawthorns. It's raining goals too. Cesc Fabregas chips a harmless looking ball to Costa, who outmuscles Gareth MacAuley on the edge of the area and chests down to Cesar Azpilicueta. The full-back hits it first time into the bottom left-hand corner for his first ever Premier League goal. Go go gadget Pedro. Chelsea's new signing puts it on a big round plate for Willian, who side-foots wide from 16 yards out. It was a superb chance. West Brom have their tails up. Callum McManaman turns Cesc Fabregas who moves as quickly as a combine harvester. Chris Brunt's cross is into the arms of Thibaut Courtois. James Morrison has hit this about three hundred times better than his penalty. Chris Brunt's deep cross from the left is brilliantly kept in by an acrobatic volley from Salomon Rondon, who cuts it back and Morrison sweetly slams it in from the edge of the area. Chelsea fans have changed their tune now. This win would pull them away from the relegation zone - so now the song is "We are staying up". Premier League? No problem for Pedro. The Spaniard now has an assist as Chelsea score from a counter after a West Brom corner. Willian takes the ball deep into Albion territory, feeds Pedro down the right channel of the area and the Spaniard hits what is probably a shot across goal - but Costa is able to poke it in. Nemanja Matic, not content with clobbering opposition players, has just boshed into Costa when the striker was chasing a Cesc Fabresgas through ball. Chelsea fans are having a bit of a sing song. I'm no genius, but it's probably got something to do with Chelsea beating United to Pedro's signature. West Brom will be ruing that penalty miss even more now. With Saido Berahino not in the squad, there was debate among the Albion players who would take the spot-kick. James Morrison and Chris Brunt had a few words. Surely you know who your penalty taker is? It should be noted that the rain at The Hawthorns is teeming down - Kevin Costner in Waterworld type heavy. Manchester United fans look away now. We were just asking ourselves in the office, has Pedro done anything? The answer: He has now. The Spaniard plays a lovely interchange with Hazard to get himself into the area. His effort takes a little nick off Jonas Olsson and spins into the bottom corner. This is a terrific spell for Albion. James Morrison swings in a free-kick from the right which Craig Dawson rises to meet - it's firm, but high and over. In terms of the penalty, it looked nailed on. Callum McManaman cut in and Nemanja Matic had no complaints after dangling out a leg. McNamaman has the beating of his man again, as Matic gets a booking for another challenge. Oh no James Morrison. It's straight down the middle and Thibaut Courtois leaves enough of his trailing body to keep out the spot-kick, saving with his legs. Will West Brom get a better chance? Nemanja Matic fouls Callum McManaman, leaving his leg out towards the edge of the area. Clumsy from the Chelsea man. When you're absorbing pressure, you can hit on the counter, and that's what West Brom do. James Morrison loops a ball through for Salomon Rondon, whose first-time effort skews wide. At the risk of fitting a Tony Pulis stereotype, West Brom look content to knock a few balls forward. It's not sticking though, and Chelsea can get it down - slow and patient from the visitors. James Morrison took a nasty one to the ankle from Chelsea's Kurt Zouma amid all that. The West Brom man looks OK though. Chelsea have settled down and are moving the ball around. The Chelsea defence looks immediately like it would rather be somewhere else. They fail to deal with a cross and James McClean and Salomon Rondon come close to bundling it in. At the other end Costa finds space, but drags wide. Lively. We're under way and James Morrison gets in an early cross from the right, straight into the arms of Courtois. A few of you have been nattering about Oscar not being in the Chelsea squad. The Brazilian has an injury - although the type of injury is unspecified. Ramires? Who knows? Feel free to make up your reasons as and when you desire. A lot of managers would not have put their new signing straight into the line of fire a few days after his arrival. 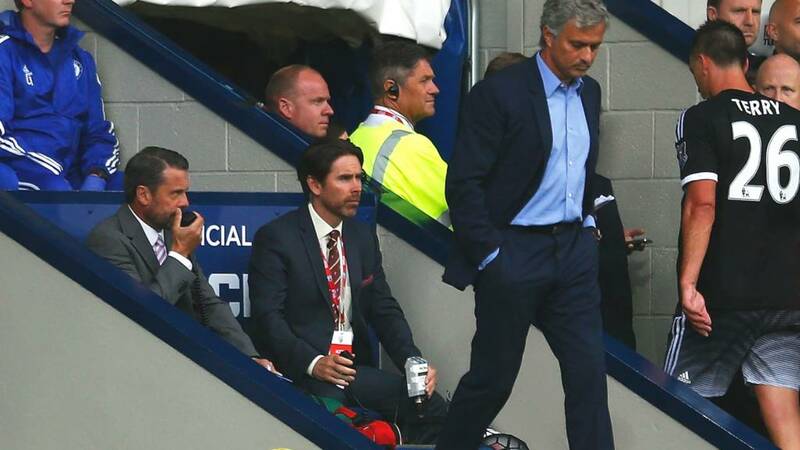 Jose is a maverick though. Let’s see, let’s not be too demanding [and expect] everything in the first day after only three days of training. But everybody knows his qualities, it's just a question of how long he needs to adapt. He is a super player. I knew the question was coming because you’re interested in the players not playing. So next week instead of the line-up, we will give the names of the players who don’t start. I don’t have to tell you [why I picked Kurt Zouma], it’s my decision. Pedro, Rondon, transfer windows, Mourinho. etc etc. Give us your thoughts. Get in touch using #bbcfootball, text 81111 or use the MOTD Facebook page. Quite a bit of symmetry between these teams. Neither have won a game yet. Both have one point. Both have a -3 goal difference. And both have been beaten 3-0 by Manchester City this season. "West Brom need strengthening throughout but Tony Pulis has money to spend and will bring in new players this week to steer the Baggies to safety again. "Mourinho rates Pulis as one of his toughest opponents but the Baggies boss knows it'll be extremely tough to get anything from this one." It's a special milestone for Jose Mourinho today - 300 games across his two spells as Chelsea boss. "It’s absolutely ridiculous we are talking about something outside football. If you close the transfer window before the season starts, everybody can concentrate on football. A lot of clubs get affected during the window and we are not talking about football - which is down to the system." What do you make of Saido Berahino's absence? Pedro's debut? Gary Cahill being dropped? A Venezuela international, Salomon Rondon scored 20 goals in 37 appearances for Zenit St Petersburg last season. He's has also played for Rubin Kazan and Malaga. West Brom manager Tony Pulis said he spoke to Man City's Chilean boss Manuel Pellegrini - who managed the striker at Malaga - and former Zenit boss Andre Villas-Boas and that Rondon came "highly recommended". Feeling fit after pre-season? Or suffering from a hangover? With Saido Berahino nowhere to be seen in this Albion squad, there's a first start for new striker Salomon Rondon. Just a few days ago it seemed Pedro was heading to Manchester United. Today he starts for Chelsea. Gary Cahill is dropped to the bench, with Kurt Zouma coming in. Thibaut Courtois is back in goal after his suspension. No Saido Berahino in the West Brom squad. The striker is wanted by Spurs - does this mean they have their man? Rangers v Hibs is a few minutes away from starting in the Scottish Championship, but our colleagues north of the border have already got your live text commentary up and rolling. Why not join them? (But then come back here immediately, thanks). While we're on the subject of Leicester, here's a little gift for Foxes fans. It's a moment in time, with your side top of England's premier competition. Print it out. Tape it to your forehead. Put it on a T-shirt. Just enjoy it. What happened? Leicester remain unbeaten as Riyad Marhez's goal cancels out teenager Dele Ali's header. Leicester boss Claudio Ranieri: "I am happy, My players have a fantastic spirit. It was an outstanding goal and Riyad Mahrez is a very good player. Tottenham head coach Mauricio Pochettino: "I am disappointed with the draw. Last game against Stoke we lost a lead and we did it again. We deserved more again but it is a shame. While we're talking about your pre-season trials and tribulations, I'm about to make you all feel very inadequate. Oxford United midfielder Helen King spent her summer in East Africa, treating patients with malaria. Makes me feel bad about that trip to Weston-super-Mare. For the professionals the season is already a few weeks old. But for most of us amateurs, we're still slogging our way through the big build-up to the new campaign. How is your pre-season going? Looking sharp or looking lumpy? United consider move for £10.9m Pato - That's according to the Sunday Telegraph, who say that both Manchester United and Chelsea have been offered the chance to sign Brazilian striker Alexandre Pato from Corinthians. Yesterday saw the advent of the drinks break in the Premier League - all but one of the six fixtures used it. So, in honour of this momentous day in history, the boys in the Match of the Day studio took a brief respite from their analysis to take a quick sip of water. Watch it on the Match of the Day Facebook page. News coming from the FA that two footballers are among those killed in the Shoreham air crash. Less than two hours until kick-off at the Hawthorns. But not too long until we get the team news. Man Utd need a new striker? Possibly also because Chelsea were able to get Pedro in, while Manchester United are very much as you were. Use #bbcfootball to join in the debate on this topic, or anything that takes your fancy. 'We Won't Panic Buy' - that's the Mail on Sunday's headline, echoing the questions over Manchester United's lack of goals. Louis van Gaal is not overly concerned, it seems. How quickly was the car moving in a car park?! Hopefully your pre-season stories are a little more uplifting than poor Ben's. How is your fitness? Piled on the pounds or are you a real Slim Jim? A lot of talk today about whether Louis van Gaal needs to get a new striker sorted at Manchester United. It's definitely been an arduous start to the season for Wayne Rooney, who defined the term isolated against Newcastle yesterday. Aside from his disallowed goal, he had three sniffs of a chance. And one of those was blocked. What happened? Wayne Rooney had a goal disallowed for offside - it was a tight decision. But United generally looked blunt up front against a stubborn Newcastle side. Manchester United boss Louis van Gaal: "We did not make the right choices in the final third but we played fantastic as a team. I like these kind of games when we work like this, but not this result. "The performance was one of the best in my period but we don't reward ourselves and there was only one club that wanted to win and that was us." Newcastle United manager Steve McClaren: "We're disappointed. We knew the first 20 minutes would be theirs but we grew in belief and we should have scored. "The defending and discipline was superb but we really could have nicked it - we had the chances but didn't take them." Our friends in Finland are just entering their Sunday league pre-season. Missing a game to go hunting for some trout is not a great way to win over your team-mates. What have you done to get in shape, or get out of shape, this pre-season? Use #GetInspired on Twitter, go to our Facebook page, or text us on 81111. Paulo Wanchope is everywhere at the moment. The former Manchester City striker resigned as Costa Rica boss last week after getting into a pitchside brawl. Nope, it's not the cricket. England's blind footballers have made a cracking start to the European Championships, beating Poland 7-0 yesterday. The hosts, the only home nation in the tournament, face Turkey today. Spain are the defending champions. Read more about it here. Plenty of you getting involved in our chat about pre-season regimes, setbacks and tips on our Facebook page. You can also use #GetInspired on Twitter and text us on 81111. Jeffery Pig: Gave up booze for four weeks pre season and feel like I had more energy. Rhys Barbour: What I thought was a good idea was playing golf, I was completely wrong. Stuart Webb: I started boxing, commited to a fight, but now footy is back in thinkin "hmmm was this the right thing to do"
'Wembley Blues' is the headline on the back of the Sunday Mirror. The paper says Chelsea will move to Wembley while Stamford Bridge is revamped for three seasons, starting in 2017. Fancy seeing Mourinho's men at the home of football? We'll take a look at each of yesterday's games one at a time, but here are a couple of other footballing headlines you may have missed this morning. 'Man Utd don't need a striker' - Wayne Rooney may not have scored in his lone role up front for Manchester United, but boss Louis van Gaal says he does not need to buy a striker. QPR confident of keeping Austin - QPR manager Chris Ramsey says he has no "indication" that striker Charlie Austin will leave Loftus Road this summer, despite intense speculation. In case you were interested, I spent my pre-season moving house, putting up flatpack furniture, lifting fridges and painting walls. Gave myself sciatica. In my first game back someone described me as an 'ostrich' (it wasn't Nigel Pearson). So that went well. What about your pre-season? Has it been as energetic as that of the professionals? Use #GetInspired on Twitter or text on 81111 stating your name and location. Callum Wilson's hat-trick helped Bournemouth to their first ever top-flight win, as the Cherries survived a Hammers fightback. West Ham boss Slaven Bilic: "It went wrong from the start. We played a very bad first half. It's not an alarming situation but we can't continue to play without more desire. We simply need a better mentality." Bournemouth manager Eddie Howe: "It was a really strange game. We were in cruise control in the first half but that seemed to go out of the window after half-time when we made some strange decisions. "The only disappointment at half-time was that we were not more than 2-0 up." Read more reaction and analysis here. By do this, Gary Cahill presumably means 'none of us get substituted at half-time boys'. It's all part of the service, Jack. What have you done this pre-season to keep yourself fit? Or more to the point, what haven't you done? Use #GetInspired on Twitter or text us on 81111 stating your name and location. Plenty of football to get your teeth into today. There's commentary of Rangers v Hibs on BBC Radio Scotland from 12:30 BST, then Everton v Manchester City on 5 live at 16:00 BST, followed by football phone-in 606. And you can finish off your weekend by watching Match of the Day 2 on BBC One at 22:30 BST. Get a full run down of what's on the BBC right here. We'll start our review of today's back pages with a look at the Sunday Express. They lead on Everton's John Stones, with the headline 'Please Let Me Go'. The paper says the centre-half will "beg" chairman Bill Kenwright to allow him to move to Chelsea. David De Gea's relationship with Manchester United manager Louis van Gaal has broken down completely. John Terry fears for his Chelsea future after inquiries were made over Real Madrid's Raphael Varane. Chelsea boss Jose Mourinho may use midfielders Ramires and Juan Cuadrado as bait in his bid to sign Juventus midfielder Paul Pogba. All that, and a lot more, in today's gossip. The big boys are not the only ones to have brushed off those early season cobwebs. Stars of Sunday parks, pub teams and little leagues up and down the country will be getting back into the swing of things. So tell us about your pre-season regimes. Who's come back a few pies heavier, who's lapping everyone on the jog around the pitch, and what do you do to get yourself through the long, lonely summer? Use #GetInspired on Twitter to tell us and if you're at training today, why not send us a picture? You can also text us on 81111, just make sure you include your name and location. But before then, grab yourself a coffee, orange juice or perhaps even a hot squash, maybe pop a couple of pain au chocolat in the oven, and kick back as we go through yesterday's action, today's papers and all the rest of the news from the footballing word. Look at that grin. Just look at it. That's a man without a care in the world. Jose Mourinho might look as happy as Larry, but today's a big day for his Chelsea side. No wins, one point, five goals conceded from two games. The Blues are at West Brom (KO 13:30 BST) this afternoon, and then Everton host Manchester City and Southampton are travelling to Watford (both 16:00). So stick around, we'll have it all covered for you today.